In my time as a teacher, probably the most common question people have for me is “What’s the deal with your beard?” The next common question people have for me is “How do I name ionic compounds?” We’ll explore the answer to one of these questions in this tutorial. But seriously, what’s up with the beard? Before we name: Is it ionic? Before you can write the names of ionic compounds, it’s important that you make sure you’re actually dealing with an ionic compound. After all, if you do a great job of naming your ionic compound but the compound is actually covalent, you still won’t get the answer right. If you’ll recall the tutorial about ionic compounds, ionic compounds are compounds in which cations (ions with positive charge) are attracted to anions (ions with negative charge) in great big crystals. If you’ve got only nonmetals, and if the ammonium ion isn’t the cation, you’re probably looking at a covalent compound. Go check out the tutorial for those (links to the right of this page). If you’d like to learn to name ionic compounds, follow these steps. If you follow these steps, you’ll get everything right and your family will love you. If you don’t follow these steps, your life will descend into misery and bitterness until you eventually end up having a heart attack when you’re 45. 1) Ionic compound names consist of two words. The first word is the name of the cation (the first ion) and the second word is the name of the anion (the second one). If the cation is a metal, write down the name of the metal. If the cation is the ammonium ion (NH4+), just write “ammonium” as the first word. Using these, NaCl has the first word “sodium” and “Li2SO4” has the first word “lithium.” It’s simple! If the anion is just one element (as in the case of NaCl or CaF2), just write the name of that element with “-ide” at the end. For example, the second word in NaCl would be “chloride” and the second word in CaF2 is “fluoride”. This makes NaNO3 into “sodium nitrate” and PbCO3 into “lead carbonate.” No biggie, right? Step 2: Are we done yet? Admit it: Like all people, you love the fresh, crisp flavor of Fresca. Transition metal cations need Roman numerals. Exceptions: Zn, Ag, and Cd, which don’t require Roman numerals. Main block element cations don’t need Roman numerals. Exceptions: Pb, Sn, and Bi, which do require Roman numerals. Ammonium doesn’t need a Roman numeral. If the rules above have told you that you need a Roman numeral, then congratulations! You’ve got a little more work ahead of you. If they say that you did not need a Roman numeral, please stop reading. Your formula is finished and adding a Roman numeral will actually make it wrong. The Roman numerals in formulas indicate the amount of positive charge on a cation. For example, the iron(II) ion has a charge of +2, and the copper(I) ion has a charge of +1. The reason some cations need this and some do not is that some cations can have more than one possible charge. For example, you can have copper with a charge of +1 or with a charge of +2, and it’s important that you be able to distinguish them. Find out how many cations you have. This is the number written as a subscript below the formula of the cation. For example, FeF2 has one iron atom, while Cu2O has two copper atoms. Find out how many anions you have. If your anion is an element, this is the number written as a subscript below its formula. If your anion is a polyatomic ion, we can assume it’s always “1” unless we see parentheses around the anion formula – in this case, the number after the parentheses is the number of anions. As a result, CuCl has one chlorine atom, CuCl2 has two chlorine atoms, CuNO3 has one nitrate ion, and Cu(NO3)2 has two nitrate ions. Find out the charge on the anion. If the anion is an element, just count on the periodic table to the next noble gas (for example, Cl is one away from Ar, giving it a charge of -1). 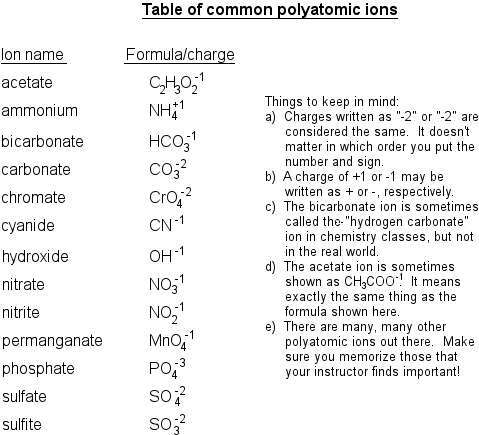 If it’s a polyatomic ion, you should either have the charge memorized or have a table on which you can look it up. As an example, we would find that Fe(OH)2 has a Roman numeral of (2)(-1)/1 = -2. We’ll just leave off the negative sign to call it 2, or II. As a result, Fe(OH)2 is iron(II) hydroxide. If your Roman numeral isn’t a whole number, it’s wrong. If your Roman numeral is greater than seven (VII), it’s wrong. If you wrote a Roman numeral and you didn’t have to, it’s wrong. If the Roman numeral is 1 (I) and you left it off, it’s wrong. Anyway, that’s how to name compounds. Because this whole tutorial took longer than I thought, I’ll include writing ionic formulas in the next one. 1. 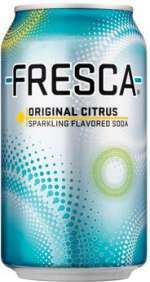 Fresca is a registered trademark of the Coca-Cola Company. The Coca-Cola Company neither sponsors nor endorses this website or anything included herein. It would be awesome if they did, but they don’t. 2. The slogan “It’s a taste and a feeling all wrapped up in one!” is copyrighted by the Coca-Cola Company, who neither sponsors nor endorses this website or anything included herein. I, on the other hand, would like to tell you that I think Fresca is an absolutely fantastic product. I particularly like the Original Citrus flavor, though they’re all quite good. Except peach. I don’t care for that one. 3. You can practice learning the Roman numerals by watching Super Bowl reruns or by getting a really old wristwatch. Or by taking Latin, which has become inexplicably popular lately. 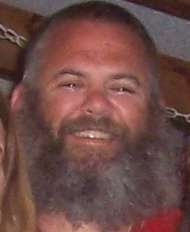 Me and my beautiful beard: My dad has no beautiful beard and is secretly jealous of my beard’s awesomeness. Fresca: 17 USC Section 7 allows for fair use of commercial photographs, under certain, very limited circumstances. Kids, please don’t assume that you can use any picture from the Internet under “fair use” – it doesn’t work that way. That’s why your teachers keep bugging you about copyright and plagiarism. For more information about fair use, visit this site. The information on this page was written on December 19, 2014 by Ian Guch and is copyrighted according to U.S. law. However, you may use these resources subject to the the Creative Commons Attribution-NonCommerical-ShareAlike 4.0 International license (CC BY-NC 4.0). 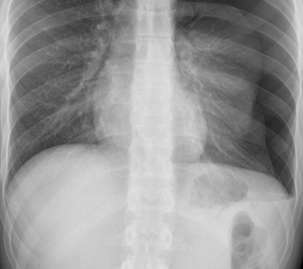 For more information about this license and how it affects how you can use the contents of this site, visit http://creativecommons.org.